Recently I wrote about the process of buying a new road bike. At the time I had tons of questions. My husband and I were buying road bikes together and it turned out that his bike was delivered to the store a week before mine. I watched as he got an orientation to his bike, was shown how the gears worked (very different than I’d ever seen), did a test ride around the parking lot, and talked through the various carbon components with the Bike Doctor’s bike expert. I tried to pay close attention knowing I would be doing the same thing soon enough. Originally the Cannondale Synapse bike I ordered was to have an aluminum frame but nowhere could the Bike Doctor find one in my size. I was upgraded to a carbon frame on a 9-speed bike rather than a 10-speed bike with the rest of the components being essentially the same. The bike I’ve been training on so far is a 9-speed so while I understand there are certain advantages to having just two big gears, I was comfortable knowing my new bike would have a set-up I’m familiar with. Finally, my Cannondale Synapse Feminine 6 arrived and I went to the store to meet her (yep, I refer to my bike as a female and am working on names now!). Because I ordered a bike with Time clip-in pedals, part of my process in picking up my bike would be to buy the appropriate shoes. Never having imagined I would ride with clip-ins I was nervous about the process of both buying the shoes and riding in them. I don’t know anything about shoes that aren’t running shoes so I had no idea what type of fit to expect. In the end I trusted the word of Gary at the Bike Doctor. Most clip-in shoes seem to be sized with European sizing and the best I could gather from the bit of research I did was that my normal size 9 U.S. would be a Euro 41.5. I asked whether shoes should fit big like running shoes and learned that no, they do not need to be a size bigger. The foot in a riding shoe should not be moving around much at all. The heel should be snug in the shoe and while it’s ok to have a little wiggle room in the toes, there is no need to go up a size. I tried on a Shimano size 42 which was too large and strangely a Shimano size 41 was too small. Gary fit me with a Bontrager Race Road WSD shoe in a size 42 that fit perfectly; it was like being Cinderella for a moment! As cool as I thought the shoes looked and as well as they fit, I was still nervous about riding in them. 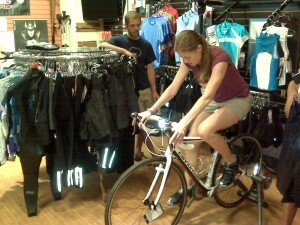 Gary put my new bike on a trainer in the store so I could practice clipping in and out of the pedals. My husband pointed out that I kept trying to line the toe of the shoe up with the clip-in part of the pedal when in fact the actual clip is more centered in the shoe. Noted! From there I graduated to the parking lot and practiced clipping in, stopping, and clipping out. It wasn’t nearly as scary as I thought it might be, but I knew it would take some practice. With a beautiful weekend ahead of me I mapped out a 19.12 mile ride that would involve rolling hills and stretches of flat. In my rides so far I have been frustrated with my performance on flat stretches and would prefer rolling hills any day. On a hill, I am very focused on my form, movements, and strength to get up, and downhills are just fun; but on a flat road I have not been able to maintain speed, a comfortable sitting position, or a consistent cadence and rotation with my legs. My goal on the new bike was to figure out how to ride better on flat stretches. I noticed almost immediately what a difference it made to be riding a bike that actually fit me. My borrowed bike fit fine as far as height was concerned but the distance of the handlebars from the seat had me stretching quite a bit. The Cannondale set-up is perfect. I have just enough bend in my arms when I lean forward that my elbows aren’t locked and it’s much more comfortable. Despite the fact that I found myself in a better zone while riding flat stretches, I still prefer hills. Flat is nice to pound out a steady cadence, but I enjoy the challenge and variety of riding hills. 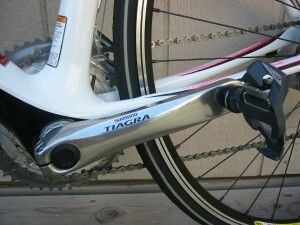 And the Shimano gears on the new bike have one very cool feature that makes riding hills all the more rewarding. After going into a low set of gears to climb a hill, the second the decline starts and the speed increases, the shifters allow you to dump three gears at once so that you quickly move into a more appropriate higher gear setting. The first time I used this feature I think I was grinning ear to ear under my helmet. The quick gear change was so smooth I never lost a beat in my pedal stroke. Since I began triathlon training I have been wondering if I would ever come to enjoy the biking. I started out with a combination of spin class and rides on my mountain bike to get in the biking time the schedule requires. Then I moved on to a borrowed Trek road bike and the rides seemed to get a little better. 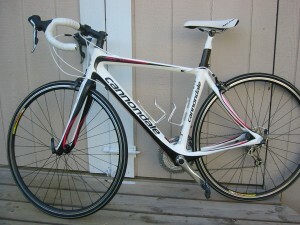 When I returned home from my first ride on my new Cannondale with successful clip-in/clip-out experiences and an improved performance on flat stretches I was thrilled. In fact, I think I said I was in love. I still have much to learn about road biking and I still have tons of questions. But now that I have Jane (at least that’s what I’m calling her for the moment), I welcome biking with open arms. 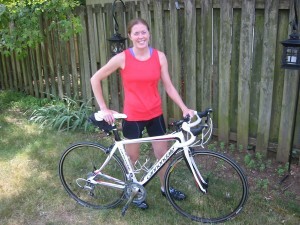 This entry was posted in Healthy Living and tagged Bike Doctor, biking, Bontrager, Cannondale, clip-in, Shimano, Time pedals, Triathlon on July 13, 2009 by Natalie. I won a pair of Bontrager shoes from a local bike store. I’d never used clip-in shoes before, but I must say that I am really enjoying them. They look a little funny on my old bike, but I like the extra power they give – especially on the hills.